Posted By:Unknown | At:7:17 AM Be the first to comment! 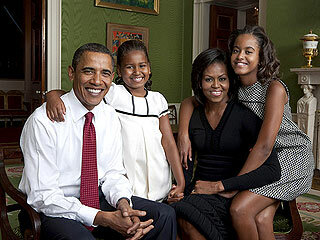 People magazine released an excerpt from the President's 2011 Father's Day message. To read the entire essay pick up the newest issue of People, on newsstands Friday. I grew up without a father around. I have certain memories of him taking me to my first jazz concert and giving me my first basketball as a Christmas present. But he left when I was two years old. And even though my sister and I were lucky enough to be raised by a wonderful mother and caring grandparents, I always felt his absence and wondered what it would have been like if he had been a greater presence in my life. I still do. It is perhaps for this reason that fatherhood is so important to me, and why I've tried so hard to be there for my own children. That's not to say I've always been a perfect dad. I haven't. When Malia and Sasha were younger, work kept me away from home more than it should have. At times, the burden of raising our two daughters has fallen too heavily on Michelle. During the campaign, not a day went by that I didn't wish I could spend more time with the family I love more than anything else in the world. But through my own experiences, and my continued efforts to be a better father, I have learned something over the years about what children need most from their parents.